Wow Jess, that is fantastic! Yay! You must be thrilled! Wowee!!! that is so fun!! Congrats! Congratulations! Wonderful--and the fabric looks so great. Marvelous! I entered; I hope I win! Congratulations, you must be very very happy! I just saw this last night. I thought that was your fabric. How Exciting!!! That must be so cool to look through a magazine and see your fabric, like "oh look! thats mine!" 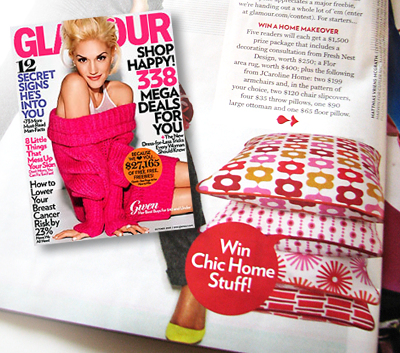 And why shouldn't your fabric be on the cover of Glamour??? So nice. Great cover picture. You don't know me (of course) but I am so proud of you and your fabric. I'm not a legal resident of the States so I can't win the Glamour prize, but I can dream. I just received my Glamour magazine today and I noticed your fabric immediately! Congratulations on such a wonderful page spread. Congratulations! They look amazing in a spread. Thanks for the room makeover info. I'm entered now. Congrats, that is awesome! Thanks for the link to the contest, my living room definitely needs some help! wow that is AWESOME! congratulations! That is awesome! :) Well done! That's flipping awesome. May this be the first of many mentions of your work on the national stage! How awesome! Thanks for the heads up on a makeover...our home could definitely use a visual sprucing up. I'm very happy for you! You deserve each success! I was so happy for you when I saw that spread. Cngrats!! CONGRATULATIONS! THAT IS SOOO EXCITING!! WOW! Absolutely. She just doesn't know it yet. Yay! You are some famous! I bet Gwen would LOVE your fabric. well, look at you. so I'm two degrees and 46 pages of separation from Gwen Stefani. I saw this and recognized your fabric right away!! Congratulations!! I know! I saw that and reacted like I'd seen a friend n the pages of Glamour..."I KNOW that girl!!"